To really add to the party experience, we can add an optional makeover for each guest. Diva has its very own qualified make up artist who can do as much or as little as is appropriate for each guest. We know that parents don’t want their pre teens to look like American Beauty Pageant Queens so our makeovers for younger guests will typically comprise of a slick of mascara, some clear lipgloss, a subtle dab of eyeshadow, exclusive glitter dust – we’ll then tong their hair, clip it up, straighten it whatever the child wants – or how about some temporary glitter tattoos? 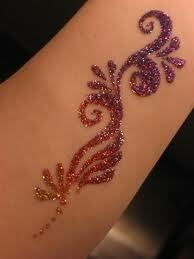 We have a range that the younger guests can choose from – including some exclusive Diva tattoos! Older party divas and teenagers will be able to have glamorous makeover designed to bring out their very best features, using hypoallergenic makeup. A full consultancy on their current make up and advice will add to the experience. Hair styling will finish the look so that the girls look gorgeous when they go in front of the camera. The Diva Party Hot Tub – can be used in all weather! Some of our Diva’s have really made the party special by arriving in a stretch limousine. Unfortunately the local company we used to use has now finished trading so we suggest if you like this idea to organise your own limousine. However we can recommend Krystal Limousine Hire based in Lincoln. They can also arrange for your Diva’s to be brought by a fire engine or a police car if you really want to be different! * non alcoholic for under 18’s!